F and I day with Jeremy Michaels FBHS coaching the coaches, 24th March 2014. Jeremy Michaels FBHS as the coach’s coach. Always a wonderful setting at Shorthampton we were all very appreciative of the improved weather. Four lucky BHSI’s Mandy, Judith Murphy, Jo Ivemey, myself and my guest Sue Barr were to benefit from a marvellous days coaching. Mandy had produced for us a diverse selection of her clients, a wealth of wonderful horses and riders of every possible type. Our grateful thanks to our Demo riders…. Tonya Wood, on a lovely young eventer and another big horse competing at novice, young riders Lucy Goodey and Alex Byrne, and Fiona riding her pony gold medal winning daughter’s 3 eventers aiming at juniors. The horses also varied from small and athletic to big and strong eventers and ranged across all stages of eventing training up to 2 star. Even Mandy, riding the sweetest little welsh pony, was coached by my nervous guest Sue Barr! The morning session began with dressage with Jeremy coaching the first few riders and asking us all to participate in assessments and suggestions for improvement. There was such an interesting variety of combinations that every aspect of coaching skills was needed. 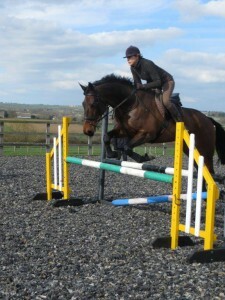 Jeremy rode two superbly, demonstrating the huge benefit of having a ‘sit upon’ to feel of the horse’s way of going. Many different ideas were tossed about – but the overriding conclusion was to try to think positive and seek and enhance the good bits in each combination. The importance of having a horse working willingly off light aids was agreed as key to success as was the essential requirement of a secure and balanced rider. Much mention was made of Chris Bartle and his ‘wheelbarrows’ analogue for helping riders not to pull back at the horses head. Also the benefit of a clear riders ‘body statement’ helping to set the horse up for the intended movement or transition. Molly Sivewright was also frequently referred to, especially the value of ensuring the correct distribution of the riders’ weight and the effectiveness of a rider lifting their diaphragm to prevent them tipping forward. The benefits of many transitions within and between the gaits were shown to improve the horse’s willingness and hind leg engagement – and the horse and rider partnership. Mandy added the wonderful contribution that ‘what’s in the brain goes down the rein’! Molly Sivewright’s and Chris Bartle’s brilliant books are still as relevant today as when they were written! Each person had a chance to coach one of the riders, overseen by Jeremy, and comments were offered from him and then from the riders. My rider was young Alex on a lovely big grey welsh gelding who was very sharp and we worked on the riders role in calming the horses emotions. I asked my rider to ignore all the horse’s little dramas and crises concentrating on controlling his rhythm and breathing whilst maintaining a secure position – she found this helpful. I do find hot horses can cause themselves problems when they forget to breathe out! Everyone found Jeremy’s comments very useful and encouraging -and then we all repaired to Mandy’s lovely old farmhouse for lunch. Mandy had made a wonderful Scandinavian chicken – a light creamy version of coronation chicken with fruit added – delicious. Quite an impressive feat as Mandy had only returned from skiing the day before! During lunch many ideas were tossed about and discussed especially the BHS exams, UKCC and how to encourage new coaches – younger or older – to seek qualification. In the afternoon some of the same combinations of horses and riders came forward for jump coaching and we started with pole work before moving on to grids. Again each of us took a turn to coach and further discussion, comment and encouragement was offered. 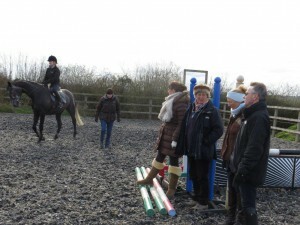 We then set out a jumping exercise with 4 small jumps set out on diagonals at 15-16 metres that could be jumped in various ways and proved effective and very helpful to all. It was also a quick and easy exercise to set up and put away! Jeremy is a wise, encouraging and helpful coach for us all and I especially found it helpful to work in front of colleagues and receive feedback and comment. Coaching can be lonely business and sometimes a bit of an ego trip… so these days are so valuable to keep ones coaching and social skills up to scratch – and ego in check!. 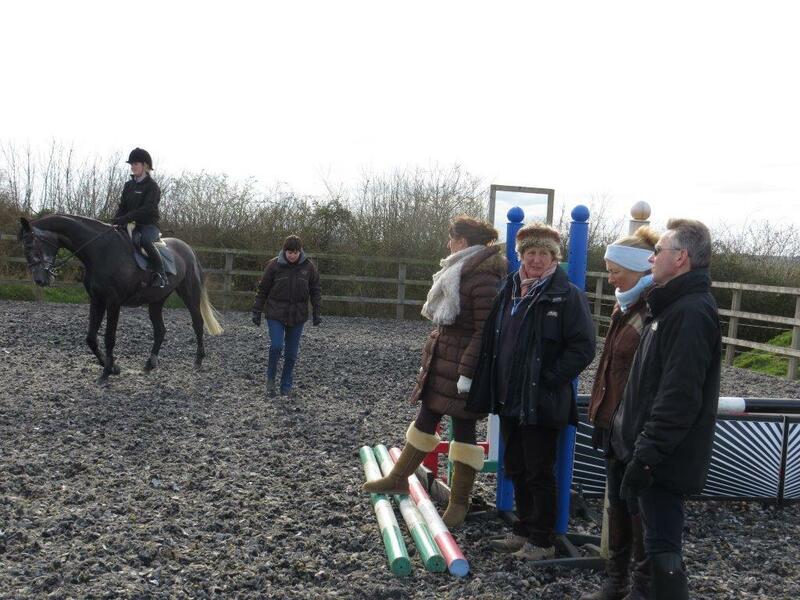 Thank you to Mandy for organising wonderful demo riders for us, a brilliant coach and a delicious lunch. Roll-on the next Mandy Holloway F and I day with Jeremy Michaels FBHS planned for later in July 2014. 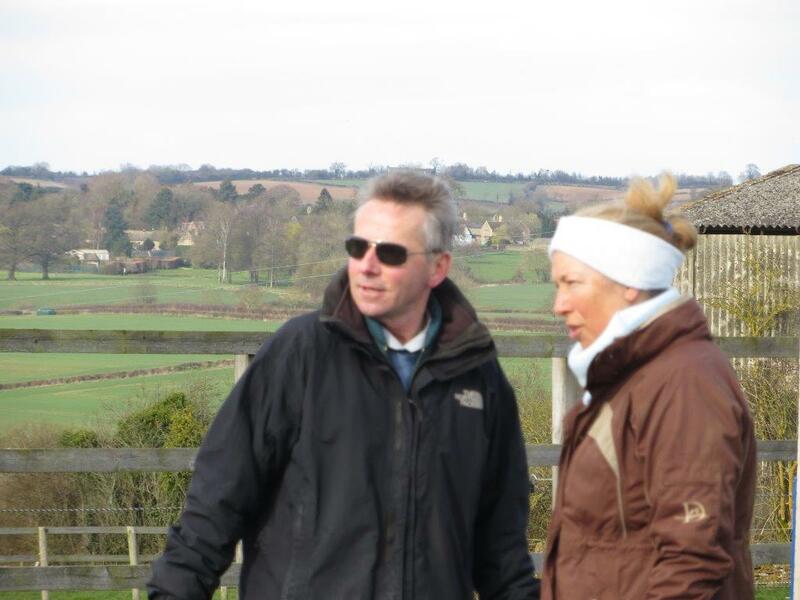 Meanwhile Mandy and Joanna are offering a day of ‘schooling horses from the ground’ and ‘developing successful horse and rider partnerships’ at Shorthampton on Tues 1st July – cost to F and I’s £30 – others £35 – or further information please contact Mandy 07753 367252 mandyholloway@hotmail.co.uk or Joanna 07968 544448 orinfo@fearlesshorse.co.uk. This was my first trip to the National Equine Forum and what a treat! Jillie and I started off the day with coffee and breakfast near Big Ben and then moved on to the very comfortable surroundings of the Institution of Mechanical Engineering. It was a delight to sit and listen to some really good speakers. There were three themed sessions. The notes from the Forum will be available online and should make good reading but I hope this report gives some idea of the topics covered. The first 5 speakers all followed the topic ‘Are you riding straight?’ . Line Greve MRCVSwho is at the AHT has done a study with Sue Dyson on saddle slip and hind limb lameness. They used over 400 horses in work and interestingly, of these, she said that over 40% showed subclinical lameness. She found that in 80% of cases the saddle slipped to the side of the lame hindlimb and when blocked out both saddle slip and rider crookedness were cured or significantly improved. This was followed on by Haydn Price Dip WCF Lead Farrier World Class Programme. In his inimitable Welsh accent he caught our imagination with his in depth presentation on theimportance of the limb and lever arm in asymmetry of movement. Vicky Spalding MCSP ACPAT BEF World Class Programme followed. Her job is to help the horse achieve dynamic symmetry and postural control. She picks up compensatory changes which cause spinal midline deviation and potentially asymmetrical muscle development affecting straightness. A couple of notes from her study….. riders unconsciously spend more time on the left rein in the warm up and horses tending to land more on the left lead had more jumping faults on the right rein. She highlighted the problems of young horses being expected to work above their maturity level. Mark Fisher RVM Consultant Master Saddler BEF World Class Programme followed exploring the role of the saddle in interaction between horse and rider. He uses Gait analysis and the Pliance pressure mapping system. We watched footage of a horse jumping wearing the Pliance. Some points from this included: The highest peak of pressure when the horse landed from the fence was when the second front leg came down, this horse had saddle slippage to the right on the left rein only and when he made the saddle stay straight the horse showed greater hock flexion, carpal and elbow flexion and a more symmetrical stride pattern. Peak pressure was reduced by up to 20%. Louise Broom MCSP then discussed the prevalence of rider asymmetry and possible causes. She works with a mechanical horse and a camera behind the rider. She demonstrated 5 types of crookedness. 1 Trunk lean 2 Ribcage lateral shift 3 Pelvic lateral shift 4 Shoulder girdle shift 5 Pelvic lateral tilt – her message was that if rider weight distribution is uneven there is a risk for the horse’s musculo skeletal system. The strong message from this topic was that you need to identify the root cause of saddle slippage and not just treat the symptoms. If only we could all have access to such a team of experts! The importance of the public perception of horses is in a world where an increasing percentage of our population humanise animals and don’t have any contact with large animals. Cultural differences , the horse as a sports partner or friend and in other countries as a common dish. Business class travel for our World Class horses and long sad journeys for the less fortunate. The need for a partnership between the FEI and OIE (World Health) to improve transport times, smooth travel and effective disease control. The need for a central European registration centre for Health control and infectious diseases. Top horses are competing 20 times or more a year helped by modern globalisation 5* all over the world aimed at a small group of riders and horses. The idea of restricting the number of starts has been raised in the past but has not come back on the agenda. The lowering of age of young horse classes is against the patient training of the up and coming horses. Increasing costs: travel, hotels, grooms, stabling – is the sport becoming one for the upper class? Political and public perception of riders is already that they are upper class. There is a consideration of a tax on each horse in Germany which would cause a strong decrease in sport. In Swedish law a horse has to have access to 8 hours of pasture or meadow land a day. Society does not accept a sport where animals are being manipulated In extreme we have to defend ourselves in using the horse as a sports partner, one day we will all be confronted with such stupid discussions. Anti Doping USA versus EU discussion Different cultural approaches needed. EU couldn’t and shouldn’t accept rules which would put our sport in danger. Endurance problems are putting enormous danger on sport as a whole and the work of the Endurance planning group is of utmost importance to all of us. The right answers are needed to idealogical people Not a matter of being right but successful , not based on ideology but on science and facts. He stressed the need to keep the public informed on horses needs. Owen Paterson MP Secretary of State for the Environment Food and Rural Affairs was due to speak next giving the Defra View but had to be in Parliament so Alick Simmons Deputy Chief ‘veterinary Officer for Defra stood in and spoke about the problems of fly grazing, Passports, Ragwort, Central Equine Information System. After an excellent lunch the afternoon session Responsible Breeding and horse ownership was covered by four speakers. A passionate speaker Roly Owers MRCVS ‘Do you need to breed’ – why we must address the root cause of the UK horse crisis I guess we all know this one only too well? Following this was an eloquent talk given by Stephen Potter. He outlined the fate of horses at the end of World War 1 and he ably defended the decision to leave the thousands of horses who had been taken from England and USA into battle in France to the French butchers and then went on to compare our present day horses who face a downward spiral of neglect rather than the abbatoir He highlighted an ignorance of good husbandry and argued against a permanent exclusion of horses from the food chain. He expressed no confidence from the horse passport review ID and Drug control regime for horses. He said he would love a call from Owen Paterson. Paul Bittar was the final speaker on this topic ‘Medication and Control in Racing’ an overview of the BHA’s anti-doping programme. Are suspensions a strong enough deterrent? Welfare issues in the USA have put racing into decline. Driving legacy from 2012 Jennie Price Chief Executive Officer, Sport England followed . She congratulated people who work in the horse industry ‘Politicians who experienced London now ‘get’ sport and get it’s power and broader social benefits.’ |The Ebony project in Peckham S E London is one of it’s grass roots projects and has given children who probably would never have had contact with a horse great benefits. The President HRH The Princess Royal concluded the day. I would thoroughly recommend this Forum as a thought -provoking and enjoyable day . Definitely worth the trip to London.